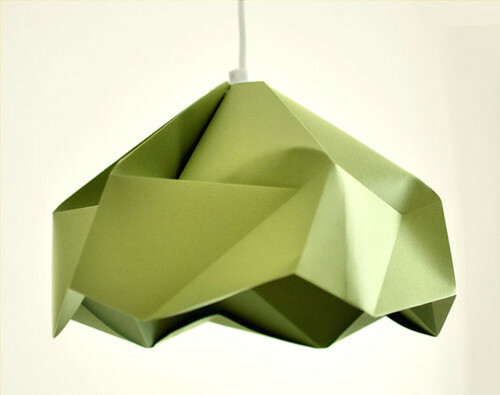 I think paper lighting fascinates so many of us because it's unexpected. Combine that thought with origami and true beauty is created... thus, I was delighted to come across Justina Yang's Etsy shop, Fiber Lab. 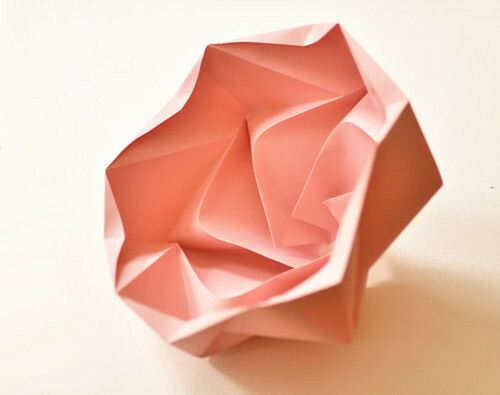 The unique, but useful paper objects she designs are her way of merging a structural engineering degree with an interest in art. This elegant snowflake lampshade in pink resembles a rose in full bloom! Justina uses acid-free, lightfast papers milled by Fabriano Tiziano and Canson to fold her own patterns. After much experimentation, she perfected the symmetry of three dimensional shapes. 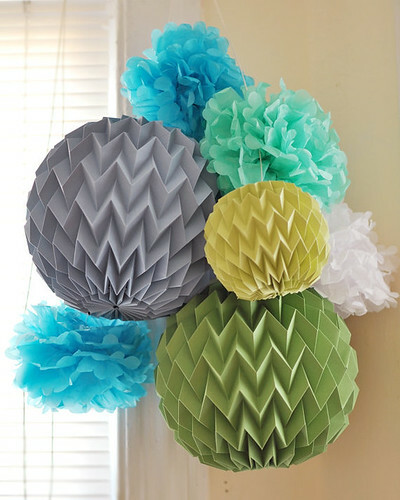 These festive bubbles would look great over a dance floor, a baby's crib, or as birthday party decorations. 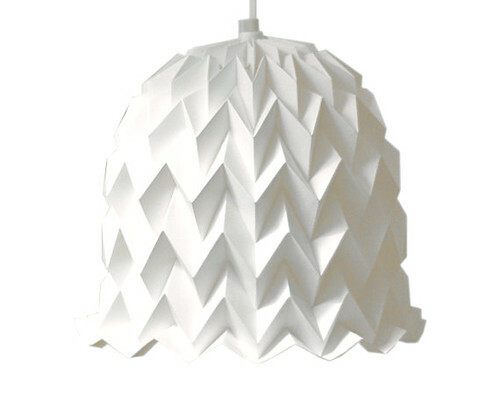 This bell lampshade is another lovely shape made with the same zigzag patterning. And here's a treat from Justina! If you're like me and have always assumed creating tessellations would be oh-so-complicated, she's provided a tutorial that shows exactly how to print out and make these folded bracelets. You can also watch a video in which she shows exactly how to make them here. Fear not, they are very doable, not to mention eye-catching! By the way, while researching this post I came across a Beyond the Lens blog entry about the rarely photographed 450 year old Canson paper mill in Annonay, France that you might enjoy seeing. Wow! these decorations are amazing! Lovely for an anniversary celebration too! I love the festive bubbles and the bell lamp shade. The tutorial does look doable. Hi Ann, thanks for linking to my blog and photos of the Canson paper mill - it was a great experience and I was truly impressed with the history and heritage of Canson paper. While the current mill is very industrialized (after all they supply paper to the entire world), the museum was indeed quaint, and we were given a tour by an elderly man who worked the mill for over 50 years years during the middle part of the 20th century. He had missing fingers to prove it, but could still operate the old steam powered mill for demonstration purposes-these photos are at the bottom of my article. Hi Robert, you're very welcome. I envy you your trip to France and Canson! Thanks for the additional information. Wow. Thanks for doing research on this. Her lamps are amazing. I wonder how long it takes to fold one of those big round ones. Thanks for the tutorial for the bracelet too and I'll check out the link to the paper mill. Howe fun. I'm glad you enjoyed the post Melissa, and thanks for your comment. 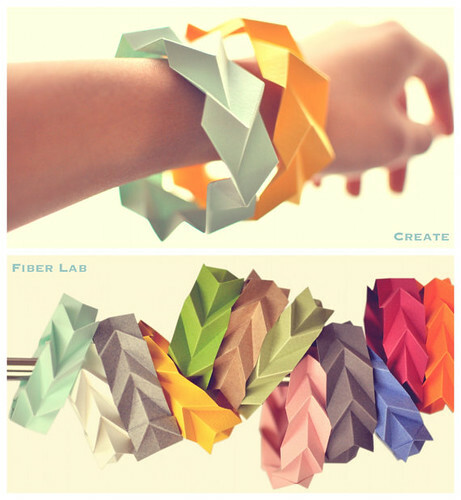 Do you think you could make a tutorial video on how to make the Tessellated Paper Bracelet by Justina of Fiber Lab? I attempted to make the bracelet myself by following the instructions on the dropbox however, I was confused on the numerous folds. Thanks! Hi Patricia, my best advice is to make sure you understand the difference between mountain and valley folds by looking at the diagrams. After you've cut out the printed strip, score all of the lines (perhaps use a mousepad under the paper to give yourself a soft surface to press on while scoring) and then fold the strip in half lengthwise along the line as shown. Start the valley and mountain folds at the end with the dot. You'll just be alternating the two folds the full length of the strip. Practice with copy paper before using card stock. I bet all of the sudden it will click with you - good luck! Hi, Ann! I'm in love with these paper bracelets, however I'm thinking what kind of paper did you used for them? I wonder if it would break easily. These are just so unique, I want to create many as gifts! I made these last night with my daughter and I printed it out on cardstock the first try. I didn't have the proper blade so I had to use a utility blade. Be very careful when scoring. I was careful and still went through the paper on one spot. Once you get the valley and mountain folds down it kind of folds itself. You just need to push it into place. My only concern was that the bracelet was very small. I followed the printing instructions and selected landscape when printing as it would have been even smaller the other way. I'll try it again and see what I can come up with.